Dezeen promotion: Vitrocsa's Turnable Corner glazing system is made up of full-height windows that can slide around corners, allowing architects to create panoramic views. The Turnable Corner system features sections of glazing that can slide independently of each other, on rollers down barely visible tracks. Only a 15-millimetre slot is needed, barely interrupting the flooring. The Swiss company has designed each panel so they can be opened from any side, even across a corner. The sections can then slide along down a wall or stack up inside a pocket, giving unobstructed access to outdoor areas. 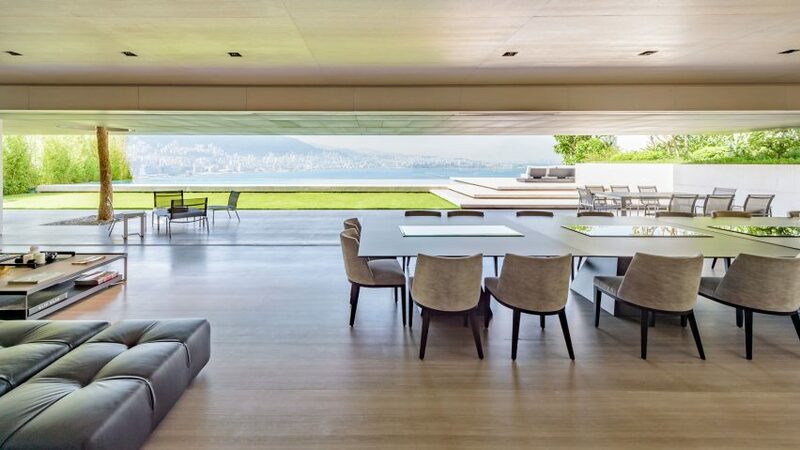 This technology allows for entire corners of buildings to feature floor-to-ceiling glazing that can open out on to gardens, terraces or a balcony without the need for chunky bi-folding doors or restrictive one-way opening systems. The Swiss glazing company first started developing the product in 2011, for a project Foster + Partners was working on in Cyprus. It recently installed it on a project in Adma, Lebanon, by Nabil Gholam Architects, called AZ House. Located on the cliffs of Maamltei, facing views out over the Jounieh bay, AZ House has a simple cube structure punctuated by cutouts. Turnable Corner is used throughout, making the most of the views and allowing the occupants to move between the indoor and outdoor spaces with ease. At ground level a long stretch of wall is made up of the glass panels, which can be pulled back to give unfettered access to the patio and infinity pool with views out over the sea. On the first floor, a glazed corner opens on to a sheltered double-height patio, and on the floor above a veranda connects the family bedrooms. The master bedroom covers the entire top floor, with its own private terrace and plunge pool. The glazing system comes with aluminium frames available with thermo-lacquered or anodised finishes, opening up an almost infinite range of colour options. Stainless steel provides the roller bearing system, so it can be used for projects near the sea without fear of rusting. There is also an integrated drainage system. See more projects on our new Pinterest board created for Vitrocsa. For more information, visit the Vitrocsa website.